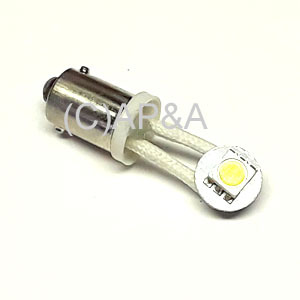 Warm white flexible-lead LED. #44/#47 style with metal bayonet (twist-in) base. 6-volt, AC or DC. Flex LEDs have 2 flexible wire leads that allow you to bend, twist, and position light in any direction you need it. They work best under playfield inserts that use horizontally-mounted light sockets, allowing you to turn and position the LED directly up through the playfield insert after installing the bulb in the socket.